Indie Retro News: Klystrack - Modern software for creating C64/NES/Amiga-style chiptunes! Klystrack - Modern software for creating C64/NES/Amiga-style chiptunes! I know for a fact that I am no good at creating music apart from banging a few keys here or there which usually ends up with people leaving the room. 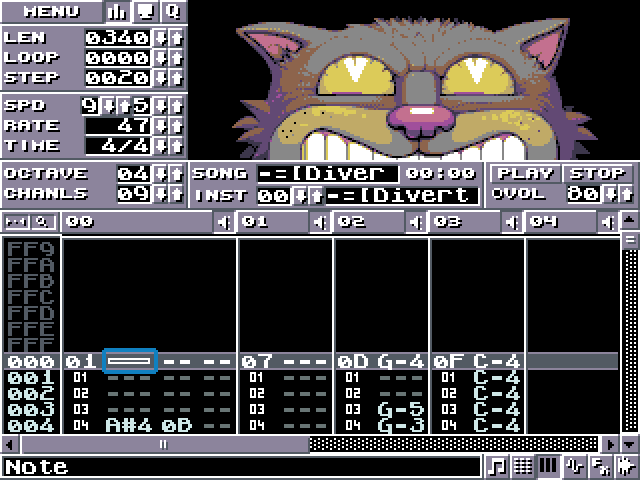 But what I do like is listening to music such as retro chiptunes or even demoscenes and tracks found on an Amiga or a C64, usually created with software such as Protracker (Amiga) which allows people to create music without studio equipment. But what if you don't have an Amiga, a C64 or a NES? Well then, welcome to Klystrack; a tracker for making C64/NES/Amiga-style chiptunes on a modern platform that can also be used for creating audio for games! Created by kometbomb with the help of iLKke, Klystrack is a feature packed software with sound additions such as additive synthesis with filters (think SID, Atari, NES etc. ), hard sync and ring modulation (like SID) , FM synthesis (think Adlib, MSX, OPL2 etc. ), wavetable for samples or custom waveforms to be used in synthesis (think Amiga, SNES), built-in wave generator and even an editor. To be honest I could be here all day talking about the features so I'll just list them below, which was found on the main website! Own custom format with a tiny playback library to be used in games, demos etc.